From 15th to 17th February 2019, the international snowkite elite will meet for the Amarok Snowkite Worldcup on Lake Resia in Italy. Up to 100 participants from all over Europe are expected in the holiday region „Reschenpass“ in South Tyrol. To date, registrations from Switzerland, Austria, Germany, Italy, the Czech Republic, France and Russia have been confirmed. Lake Resia is situated at 1500 meters above sea level and is considered THE snowkite mecca in Europe. The lake lies in an area with guaranteed snow and wind and therefore presents the perfect location for the Amarok Snowkite Worldcup. When snow kiting, the athletes are dragged over the snow with the help of huge kites and with skis or a snowboard under their feet. For three days, the snowkiters will deliver thrilling competitions in three disciplines. The Amarok Snowkite Worldcup will start with a long distance race around lake Resia on Friday. On Saturday and Sunday, the athletes will show their skills in the discipline racing. In racing the athletes have to complete several rounds of a triangle course just as known from sailing. During these races, top speeds of up to 100 km/h can be achieved. In suitable conditions with a lot of snow, the freestyle competition can also be started. This discipline is not focused on speed. Rather, it's about impressing the jury with spectacular tricks and jumps of up to 10 meters. In the discipline racing the competitors can collect important points for the IKA Snowkite Worldcup Tour. The special feature of the Amarok Snowkite Worldcup is that it also represents the official IKA Snowkite European Championship. The prestigious titles will be awarded in long-distance, racing and freestyle. The spectators can look forward to exciting duels for the Worldcup victory between the multiple World and European champions in racing/skiing Florian Gruber (GER/Garmisch-Patenkirchen) and Felix Kersten (GER/Meerbusch). Like last year, Ronny Bollhalder (SUI) will try to win the Amarok Snowkite Worldcup on the snowboard. The supporting program will not disappoint visitors either. 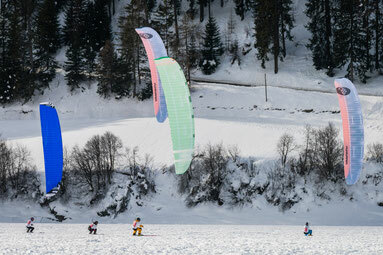 Well-known manufacturers will present the latest material for snowkiting, which can even be tested for free. Local partners will offer national delicacies and delicious hot drinks, so that a successful après-kite is guaranteed. "The sport of snowkiting may not have the same reputation as skiing or biathlon. But snowkiting is quite unique and because of that lake Resia with its distinctive church tower in the lake is the ideal location for it. As a holiday region, we are happy that we are the mecca of snowkiting and we look forward to great competitions. We wish all our guests a lot of fun in our region. ", says Gerald Burger - Managing Director Ferienresort Reschenpass.